The notoriety of Seal Team 6, also known as the Naval Special Warfare Development Group (DEVGRU), hit center stage in recent years with missions all over the world resulting in publicity, books and movies. The team comprises the Navy’s best of the very best. It is so exclusive that the highest performers have to be invited just to participate in an exhaustive tryout that lasts several months. Once on the team, they are furnished with the best equipment, much of which isn’t available to anyone else such as the stealth helicopters used in Pakistan. This effectively maximizes the production of what is arguably the most talented military unit in the world. Does anyone think that’s unfair? Of course not. The Navy is just employing a system to get the most out of the team. So then why is this type of practice not utilized within more operations? This is part of a notable lesson that hit home for me several years ago when reading Good to Great by Jim Collins. Part of his research involved asking managers whether they would assign a talented individual to a high performing operation that hadn’t yet reached its potential or a low performing operation in an attempt to turn it around. The best managers consistently said they would assign the individual to the high performing operation because it hasn’t yet reached its potential. The Navy has employed this strategy with DEVGRU and, as a result, accomplished some of the most significant international events in history. Is it more beneficial to assign the best collectors to high risk accounts? The intuitive answer is “yes,” and this approach has become the norm for many. As it turns out, that’s about the least effective method possible. Although the high performers had better collection rates than lower performers on all of the accounts, they had the least significant improvement on the highest risk accounts. The sweet spot was on accounts where there was more opportunity for better results. This makes sense when you consider most of the high risk customers simply aren’t going to pay no matter who talks to them. The same was true on the other end of the spectrum. There’s no sense in assigning the best collectors to the absolute lowest risk accounts because someone accidentally missed their due date. They’d make a payment even if Jerry from IT called them by accident. In the collections analysis I found that the highest performers had better collection rates by several hundred basis points on the segments with the most opportunity – and especially better results when compared to the low performers. The analysis projected a reduction in net loss of about $6 million and approximately $400,000 in additional revenue annually. That’s huge savings for one department, even for the villainous mega banks. The real kicker is this: it was achievable with staff that was already in place. It takes some work and analysis to set up, but a lot of value is added just by properly utilizing existing resources. I encountered another opportunity to leverage the theory behind maximizing the strongest performer for the same collections department – only this time it didn’t involve employees. In order to elicit higher response rates to mail campaigns, the bank frequently experimented with varying letters, envelopes and delivery methods to delinquent customers. The most effective method (by far) was using FedEx and, despite the high cost, it still proved to reduce losses better than any other option. The practice was used on thousands of relatively high risk accounts every month and resulted in a FedEx budget that ballooned to about $10 million per year. I was tasked with finding ways to reduce the budget by 15% within one year. The catch, of course, was that the changes couldn’t increase the losses on the portfolio. My team spent months analyzing the data and ultimately had a breakthrough by identifying the segments of accounts that had the most opportunity. Similar to the difference between high and low performing employees, the FedEx delivery method was more effective on all types of accounts. However, also similar to the previous example, there were particular account segments where the success rate increased much more than others. Ultimately, we switched to lower cost, less effective mail campaigns on multiple segments that had lower returns and introduced FedEx to a smaller population where it would maximize the impact. Not only did we exceed our $1.5 million expense reduction goal within the same year, but we did it without increasing the loss rate on the portfolio. Let’s take a step back from the exciting world of collections and understand this principle is applicable nearly everywhere. Jim Collins focused on big companies making big strategic moves, but the concept can be applied to maximize performance at the lowest levels of an organization. Every bank tries in a halfhearted way to cross sell when customers call into customer service. Yet how many use data to systematically route calls with high cross selling potential to representatives with the best sales skills? Remember how this small operational change can result in markedly improved sales performance. Think about the team aspect of the Navy Seals and the differing roles members play during a mission. Here’s a wakeup call for bankers: you are not maximizing the performance of a team just because you maximize the performance of the individuals through performance incentives. One Navy Seal completing his role does not make a successful mission. The opportunity for maximum team performance starts by identifying the high performers along with the medium and low performers in the process. Although this may seem straightforward, most bankers would be surprised how much hormonal bias they bring to the evaluation of staff. Instead, use data, data, data! Having good data in a call center really pays dividends when employing a new process. A manager might think Marco is the cream of the crop because he hits the most home runs, but the data could show Jane is the real winner because she regularly gets on base. Simply put, if managers took a bit more time to gather and analyze data, they would achieve better results 90% of the time. This fact-based approach is not only important in identifying the right people; it also has the potential to build career progression, and good metrics keep the pay for performance in check. Once a bank has taken this smart approach to assembling and developing teams, managers can then equip the high performers with the tools to maximize their value. In a call center environment, this generally means assigning them to the appropriate outbound segment and similarly routing the most valuable inbound calls to them while providing good contact management and workflow software. Ideally, a bank would use data-driven scoring models to manage these staffing queues, but even smaller operations benefit from a less complex process. The right team with the right tools and proper motivation create an atmosphere that improves itself. Not only do the numbers look better, but performance is improved with minimal (if any) incremental investment. How often does that opportunity come around? Plus, with more ambitious usage of data and talent management strategies, GonzoBankers get the added bonus of telling stories about how they maximized performance by developing a military-like special operations team. So, GonzoBankers, you may not get the worldwide attention like DEVGRU, but you’ll be sitting pretty at the quarterly executive meetings. Use the data, build the team, equip with tools and kill it! 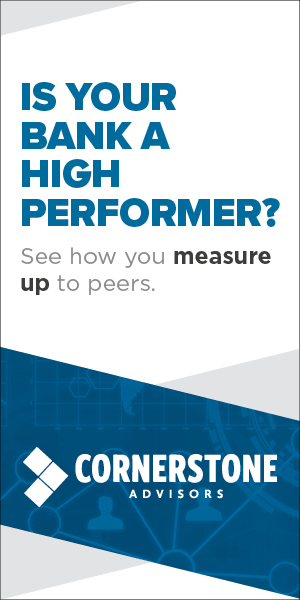 Plug in to Cornerstone Advisors’ database of peer benchmarking comparisons. Identify areas to improve performance, increase revenue and reduce expenses. Implement best practice growth disciplines across all business lines. Visit our website to learn more about Cornerstone’s Performance Solutions or contact us today to get started.